To solve a single variable equation, all you have to do is isolate x on one side of the equation and move everything else to the other side. You do that by performing the same operations on each side of the equals sign. 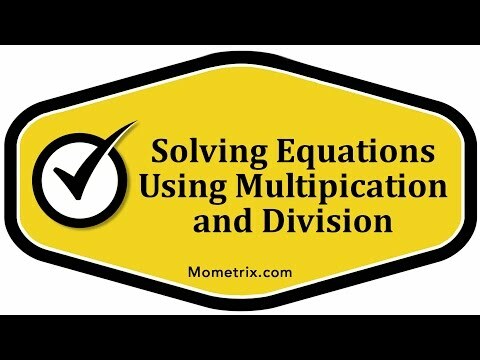 In this example here, we’re going to have to use multiplication and division to isolate x. The first thing you want to do in solving this problem is to rewrite it in a simplified form, because what we have is 3x times 12, divided by 5, equals 2x times 15x, divided by 20. Let’s simplify this a little bit. We have 3x times 12, which is 36x divided by 5. That’s equal to 2x times 15x, which is 30x, divided by 20. I’m sorry, 30x squared. The first thing we want to do is get x all by itself on one side. We’ll divide both sides of equal signed by x and that gives us 36/5 equals 30x/20. Now, the next thing to notice is that you can reduce distraction from 30/20 to 3/2, so we have 36/5 equals 3/2x. Now, we want to do is get this all by itself over here. We need to move the 3/2 onto this side of the equation. To do that, we’re going to multiply both sides by 2/3. 3/2x times 2/3 the 2s are going to cancel and the 3s are going to cancel, leaving us with x. On this side, when we multiplied by 2/3. We see that we can cancel the 3 here, 3/3 is 1, 36/3 is 12. What this leaves us with is 24/5. x equals 24/5 is our solution. If we want to write this as a mixed number, we can say that x equals 4 and 4/5 or 4.8 as a decimal.